The Zimbabwean economy continues to be a sinking ship because of the influx of second-hand imported goods in the form of clothes and cars that continue to flood into the country owing to poor industrial performance and high unemployment levels that have pushed the majority of Zimbabweans into becoming street vendors. The streets of Harare and Bulawayo are literally impassable as they are deeply congested by hordes of vendors, most of whom sell second-hand clothes which even include underwear. The Zimbabwean economy has been on a downward slip since 2000 when the Southern African country embarked on the chaotic land reform program that saw most white farmers losing their farms to the majority blacks who have failed to operate at full capacity. This has been compounded by the introduction of the controversial indigenisation and empowerment laws in 2007. These laws sought to transfer economic power to the blacks. The laws which have been deemed anti-business have been blamed for chasing away investors. The Zimbabwean economy has been molested by a deluge of second hand clothes and cars that have killed the hope of resuscitating the formal clothing and car manufacturing industries. “We don’t need to be a dumping ground for sub-standard products,” said John Robertson, a renowned economic analyst in Zimbabwe. The second hand clothes are smuggled into the country through the country’s borders with Tanzania, Mozambique and South Africa. Clothing shops have succumbed to declining sales as customers prefer to buy cheap second-hand imports from the streets. The second-hand clothes are sold along the streets in all towns with Harare and Bulawayo being the most affected (Zimbabwe’s capital and second capital cities). The markets are popularly known as ‘Kotamai Boutique’ (Kotamai is a Shona word meaning ‘to bend’ that customers bend down when choosing the clothes displayed on the pavements). The increase in the importation of second-hand clothes has had far-reaching negative consequences on the economy. Reduced sales have forced clothing factories, wholesalers and retailers to close down with more people losing their jobs as a result and reduced tax revenue for the government. Cotton farmers have not been spared the trouble as they incurred serious losses due to the drastic fall in cotton producer prices from US1.25 cents in 2011 to US0.30 cents per kilogram in 2015. The invasion of the economy by second-hand clothes has been accompanied by an upsurge in the number of second-hand Japanese vehicles. It is estimated that 1500 second-hand vehicles enter the country through all its borders every week. The continued importation of the second-hand Japanese cars has killed any hope of resuscitating the local car manufacturing industries such as Willowvale Mazda Car manufacturers that are struggling to be operational in the market dominated by cheap car imports. Environmentalists have warned that these cars are a ticking time bomb as the country has no environmentally friendly policies on how the dysfunctional cars should be disposed of. The second-hand Japanese cars have a very short life span in Zimbabwe and are normally disposed of after two years of use after importation. Mario Dube, an environmental analyst noted that all the dysfunctional vehicles are piling up at most garages and this is not good for the country as they continue to pollute the environment through the leakage of hazardous materials such as nickel and lead leak into the ground. The vendors who sell the second-hand clothes earn their living through that informal business. It is estimated that more three million people in Zimbabwe depend directly or indirectly on the informal sector for their survival. “I finished my undergraduate degree in 2010 and since then I have not found a formal job,” said a dejected Mthandazo Dube, an Accounting graduate who now survives through selling second-hand clothes at the Bulawayo City Hall. “Importing and selling second-hand clothes is my only source of living since I cannot get a proper job in the formal economic sector. Though little, the money I get here helps me to pay my rentals, buy basic food as well as send some to my parents and siblings in the rural areas”. However, the future of the vendors is under threat as the government issued a directive to all the vendors in all central business districts to leave the streets. Since the end of July violent clashes between the vendors and the police have been widespread in Harare as vendors refused to vacate their illegal trading spots. The NewsDay reported that goods worth hundreds of thousands of US dollars belonging to vendors were burnt in Harare. “Closing the Kotamai market will negatively affect the families that rely on the sector for survival and also the poor customers who have very little disposable income and cannot afford clothes in formal shops,” pointed out Christopher Mavhinge, an economic analyst from Bulawayo. Second hand goods, especially the clothes, are popular amongst the customers because they are fairly cheap as compared to clothes sold in formal shops. The clothes are more affordable to the cash strained consumers. 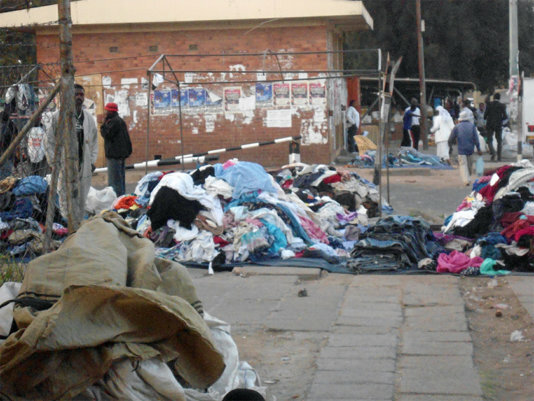 “We cannot afford to buy from formal shops and boutiques,” revealed Tatenda Mupondiwa, a regular buyer at the of second-hand clothes flea market adjacent to the Harare Central Police Station in Harare’s (Harare is Zimbabwe’s capital city) central business district. “For example, I can buy a pair of trousers for two United States dollars ($2.00) at the Kotamai market as compared to at least twenty five dollars ($25.00) in most formal shops,” said Mupondiwa. Most people in Zimbabwe have no access to disposable income that they can spend on clothes and other basic necessities. The majority of Zimbabweans are unemployed. It has been estimated that about 90% of the country’s employable population is out of employment due to massive company closures and a lack of foreign direct investment in the capital-intensive industries. The government of Zimbabwe banned the importation of second-hand clothes as a way of protecting the local clothing factories and also for health reasons. While presenting his mid-term fiscal policy review statement in July 2015 the Minister of Finance and Economic Development, Patrick Chinamasa, banned the importation of second-hand clothes and increased car import duty for small and luxury vehicles from 85% to 100%. Robertson lauded the government for introducing such policies but bemoaned the delay in the intervention by saying that, “it’s not the right time, it was supposed to be done ten years ago. It’s happening too late. However, it is better to have the policy rather than not have it all”. Despite the government having banned the second-hand clothing imports, a survey of the popular second-hand clothes flea-markets in Bulawayo and Harare revealed that that there has been an increase in the number of imports since the ban was introduced at the beginning of August. 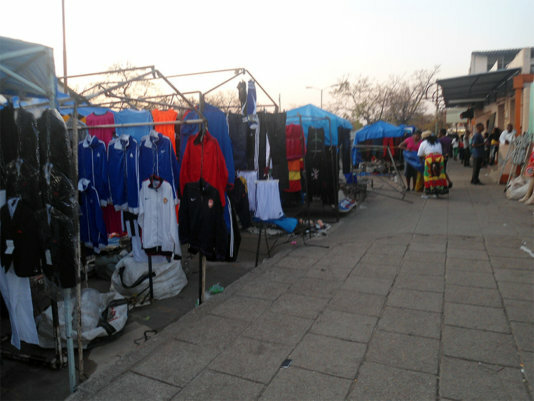 When he was asked about how the vendors managed to defy a government on all second-hand clothing imports, John Ndira, a second-hand clothes seller at the Bulawayo City Hall Kotamai flea market said that they were able to smuggle in the clothes through the borders after bribing the police and revenue officers manning the borders. “We pay US$10.00 to the police officers on duty to facilitate the passing of each bale of clothes at the border. We don’t and have never declared these clothes at the borders. After we cross at the border we make sure that we travel during the night to avoid roadblocks,” revealed Ndira. The government’s directive to ban the importation of all second-hand clothes has been described as mere lip-service meant to please the business people as it lacks the capacity to enforce the laws due to rampant corruption by the police force and revenue authorities that work at the border posts. Robertson, who is also the founder of Robertson Economic Information Services noted that the only solution to the problem of second-hand clothes in Zimbabwe was through addressing the macro-economic problems affecting the country. “There is need for the government to re-build capacity in the clothing industry through reducing production costs such as wage bills, fixing the unpleasant investment climate, lowering prices across all economic sectors including interest rates, ensuring a constant supply of electricity and improving workers’ productivity,” he explained.